Green Tea in top 10 Superfoods: a survey of 1,700 US dietitians on food trends in 2017 showed that seeds, avocado and nuts are still rated the top three superfoods, followed by fermented foods (like yogurt), ancient grains (such as quinoa and wild rice) and kale, with green tea at the 7th spot. Green Tea contains vitamin B, folate (naturally occurring folic acid), manganese, potassium, magnesium, caffeine and other antioxidants, notably catechin. Green Tea is alleged to boost weight loss, reduce cholesterol, combat cardiovascular disease, and prevent cancer and Alzheimer’s disease. The consumption of green tea extracts (GTE) or EGCG significantly reduced the gaining of body weight and/or adipose tissue weight, lowered blood glucose or insulin levels, and increased insulin sensitivity or glucose tolerance. 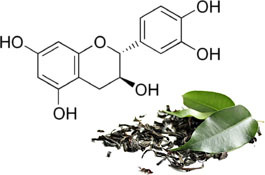 Green tea catechins (GTE) increase thermogenesis in brown fat tissue, and also consumption of GTE increase energy expenditure in a human study, These are due to its inhibitory activity of catechol-O-methyltransferase (COMT), which is a catecholamine-degrading enzyme. More sustained activity of catecholamines, such epinerphrine and norepinphrine, may encourage greater release of fat from fat cells and may up-regulate the activity of brown fat, increasing the total amount of fat burned at rest and increasing the total number of calories burned on a daily basis. Catechins have been shown to decrease lipid oxidation in the body via their antioxidant properties. Obesity might be related to an increase in lipid oxidizability, as oxidized lipids have been shown to activate certain transcription factors (nuclear factor- B and peroxisome proliferator–activated receptors), which regulate body fat metabolism. GTE supplement suggests a favorable outcome for the chemoprevention of metachronous colorectal adenomas in Korean patients. One hundred seventy-six subjects (88 per each group) who had undergone complete removal of colorectal adenomas by endoscopic polypectomy were enrolled. They were randomized into 2 groups: supplementation group (0.9 g GTE per day for 12 months) or control group without GTE supplementation. The 72-h recall method was used to collect data on food items consumed by participants at baseline and the 1-year follow-up during the past 48 h. Follow-up colonoscopy was conducted 12 months later in 143 patients (71 in control group and 72 in the GTE group). Antioxidant catechin cleanses the blood, promotes blood circulation, and removes the harmful cholesterol that causes thrombosis. In addition, catechin prevents the arteriosclerosis and blood pressure rise in advance, blood clot formation in the blood vessels, and can be adjusted to the sugar level. Catechin is effective in increasing immunity, and is a good substance that can increase immunity and virus resistance. It is excellent in detoxification and is effective in removing harmful substances and wastes accumulated in the body. The antioxidant effect removes Reactive Oxygen Species which is the main cause of the aging of the body and disease. It has the effect of reducing the skin troubles such as acne and spots and keeping it clean.